"Your adorable little fetus is busy with thumb sucking, toe wiggling, and (not so cute but equally amazing) making urine and breathing amniotic fluid as the liver, kidneys and spleen continue to develop. Lanugo (thin, downy hair) is growing all over the body for warmth." I'm three weeks out from my next obgyn appt. 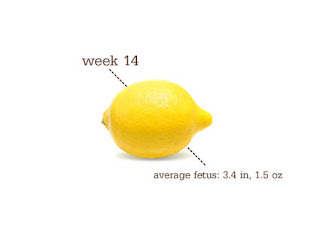 I am still miserably nauseated, exhausted, and desperate for the second trimester energy to appear. I'm so sorry you're still feeling yucky. You really deserve an easy-peasey pregnancy this time around, my dear. Here's hoping you feel much better soon. Can't wait until you feel better! Awww. Hope you're feeling better soon!